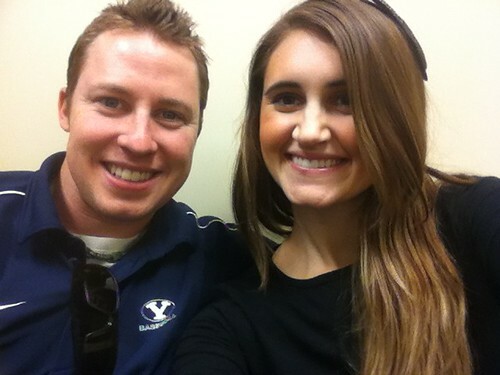 This picture was taken January 23, 2012 at our first prenatal appointment! I was 9 weeks and we heard our baby's heartbeat! It was 187 beats/minute! Kevin says we are going to have an Olympic runner hehe. Size of the Baby: Fig, just over 1.5 inches. Maternity Clothes: Nope, however I did buy a belly band at Target. I tried it on like a week ago but I felt like it was super tight although it was my size. I wear my normal jeans and haven't really gotten bigger but tight things on my stomach are just a little bothersome. I would wear leggings and jeggings every day if I could! I need more outfits to go with them :) But hopefully when I do get bigger the belly band will be comfortable? Stretch marks: Nope! Haven't put any of that stretch mark cream stuff on either...should I? Weight gain/loss: I honestly have no clue what I weigh. If anything, I've gained 0-3 lbs so far and that would be fine if I did. I weigh myself at different times of the day so it varies haha. Best Moment of the Week: The week isn't over...when do you do these things? After 11 weeks is up? Haha. Movement: I can't feel a thing but apparently our baby can stretch, do somersaults, forward rolls...according to the What to Expect.com iPhone app. Symptoms: Tiredness! If I don't eat in the morning I feel weird. I wish I could have said I did not throw up once this whole pregnancy but yesterday morning (after I hadn't eaten all night) I smelled our dirty dishes and yeah...that sucked. So I got sick for the first time yesterday. I think I need to have snacks next to me in bed and I should be fine! Sometimes I get a bad taste in my mouth and more annoying than that is the heightened sense of smell. Everything STINKS! Oh, and last week I started getting bloated :( It freaked Kevin out because I showed him my large and in charge belly...so I went to bed haha. But I was like "Woah, I am 10 weeks. I look like I'm 20. I'm HUGE!!!" Then it went down while I was sleeping...thank goodness. Kevin being freaked out freaked me out so I googled it and figured out I was bloated lol. Gender: Not sure but if you were wondering the private parts are growing this week lol. Belly Button in or out: Definitely in. Anything making you queasy or sick: My prenatal VitaFusion gummies!!! Ugh they stink. Maybe I should switch to a pill again. What I miss: ENERGY! Energy to workout, do anything. I go to bed at 8-10ish and used to stay up until midnight! What I am looking forward to: Actually getting a belly so I don't just look like I have a food baby and finding out the gender! And shopping for new clothes! Even if it is pregnancy clothes I LOVE TO SHOP! Any recommendations on where? I love Nordstrom fyi. There you have it. I hope to do these weekly. THANKS SO MUCH for all of your congratulations and excitement for us! Yay!! Congrats! and the belly band is a life saver! it will stretch, its awesome for when you have a little belly but the maternity pants make you look like you're wearing 5 sizes too big! Woohoo!!! Girl that is so exciting!! It's so interesting that pregnancy does so many crazy things to your body! So happy for you chica! There is nothing quite as exciting as a new little heartbeat. Leggins were my BEST FRIEND throughout my pregnancy. Anything pressing on my stomach made me sick. Once my regular leggins got to tight and I started to get my bump I switched to maternity leggings and they were like heaven. As far as advice on baby clothes...Nordstrom and Gap have ADORABLE clothes, but babies grow so dang fast it's almost a waste of money. My baby boy has stuff that he only wore once. I'd say until baby reaches past 12 months, stick to Target and Carters. They have way cute stuff. Good luck! wow 11 weeks how thrilling! congratulations :) I hope you have a healthy pregnancy! AH I'm so excited for you guys!!! You will be such a great mom and that baby is going to be gorgeous/handsome! You're so cute! I love the picture below, it's awesome! I'm sorry you had the puking incident, and I'm so happy the cats out of the bag! YAY! If I were you, I would take notes of what sort of things I liked/didn't like during this pregnancy. Just in case there are more coming. :) Some of my friends who've had 3 or more, could start telling what gender it was by what they craved/couldn't stand. My one friend LOVED beef and hamburger when she had her 2 boys, and couldn't even be in the house when it was cooking if she was pregnant with girls. that is so exciting...hope the back pain will go away. and i'm happy for you guys. can't wait to see the baby!!! you're so cute! don't worry about the stretch mark cream until you start popping out a bit and then lather that stuff on like nobody's business!!! LOVE the update! And that bloating story is pretty funny. I think that I would have freaked out a little too. I have yet to bloat but my baby bump is finally starting to show a wee bit! Also, I hated the gummy vitamins too. They always made me a little nauseous. I prefer the pills much more and they have the iron. And they have yet to make me sick. Woot! WOot! Aw, I'm so excited to be able to share in this journey with you. So exciting! :) You're going to be adorable with a little belly! so excited for you and your hubs. i'm obsessed with you and your life!!! you're pregnant!! AHHH!!! Sooo cute! I love reading about your pregnancy! So so exciting! !